Wolff’s is starting to blossom, and pansies are always the first flower we feature. Soon we will plant a row of these flowers along the roadside leading up to Wolff’s, and Linda Johnson, our plant and nursery manager, is planning to plant pansies at her home this weekend. Linda explains why pansies make her happy and gives advice on how to keep pansies at their happiest, too. Another reason to love pansies? Their fragrance. Blue and yellow pansies have an especially nice fragrance, which is strongest in the morning. “Two of our biggest senses are engaged in gardening,” says Linda. Gardening stimulates sight and smell. With pansies, flower gardening can also stir up your sense of taste because pansies are edible! What do they taste like? Linda says they have a slightly spicy flavor, but she puts them in salads mainly because they look stunning. When people walk into Wolff’s this time of year and see and smell pansies, Linda sees their faces light up. Even customers who don’t consider themselves gardeners smile because of the contagious sight and smell of spring. When she plants them, Linda chooses well-drained soil. Most plants like this kind of soil, and pansies are no exception. Linda says that in the area around Wolff’s, the soil is usually good. If it needs to be amended, she recommends adding compost and fertilizer. She says to water pansies in the morning, never in the evening, since it’s easy for plants to develop fungus if they get watered at night. Linda recommends planting pansies about 7-12 inches apart in a place where they will get a good four hours of sunshine. Plant them early in the spring so you’ll get the most out of them. Pansies flourish when the weather is 40-60 degrees. “Don’t feel bad when they die,” says Linda, adding that when they die it just means that their season is over and it’s time to plant a new type of flower. It is very rare for a pansy to make it through the summer. 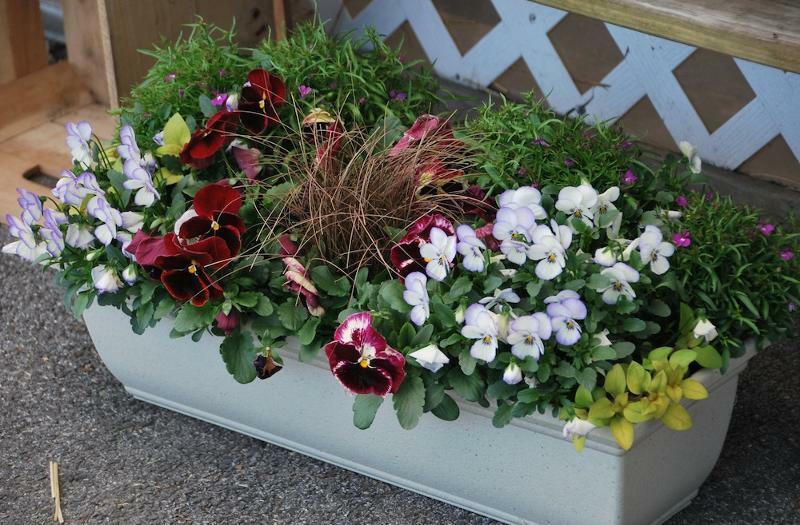 If you plant pansies early and the weather dips below freezing, the flowers might die, but the plant will still be alive and should bloom again soon. Deadheading is another way to keep your pansies blooming, especially if you have them in a flower pot. Removing the dead flowers “helps the plant produce more,” says Linda. Linda loves the way pansies look along the edge of a garden with spring bulbs like snowdrop crocuses. She also likes to plant pansies along with ferns, troweling the pansies in first, and then watching ferns pop through the pansies. Pansies are lovely along the edges of walkways, says Linda, where they create a striking visual effect. Do a quick internet search on pansies, and soon you’ll pull up pages that talk about “hardy” varieties. What makes a pansy “hardy” or not? 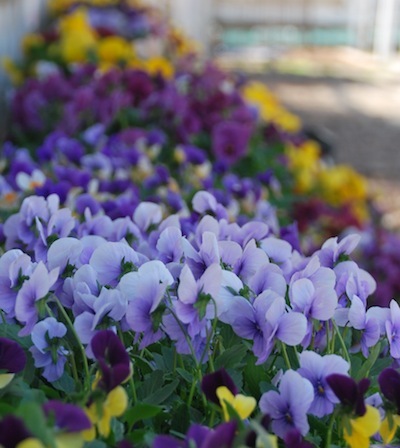 Linda explains that most pansy varieties are hardy in zones 4-8, which includes Pennsylvania. That means that if you plant them in autumn, they will pull through most Pennsylvania winters and bloom again in the spring. The pansies that Wolff’s sells come from two sources: Pratts Greenhouse in Avondale and George Didden Greenhouses, Inc. in Hatfield. These greenhouses produce pansies that are especially good for growing outside because the gardeners there do not force the plants to grow with artificial light and heat. Also, since the greenhouses are local, the plants only travel a short distance, which keeps them healthy and perky. Whether you’re a novice gardener or a pansy pro, stop by our garden center to herald the end of winter and line a walkway or garden with these chipper little flowers.